Family Dental is a well established dental practice in St. Albert that has many years of experience serving patients from all walks of life in a relaxed, fun, and comfortable atmosphere. 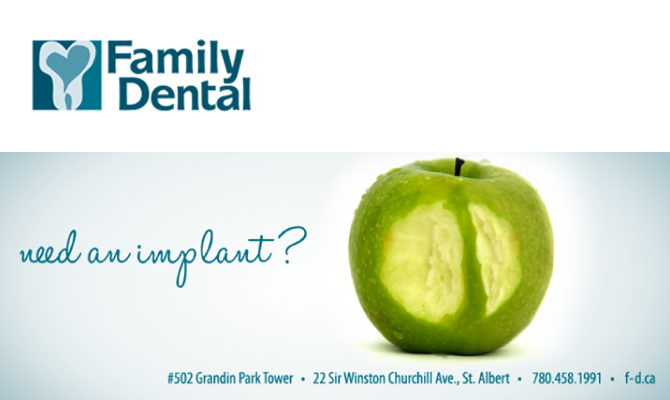 While we deliver all of the standard family dental services in St. Albert and North Edmonton, our approach is anything but “standard”. Family Dental strives to go above and beyond, ensuring that you and your family have a comfortable and pleasurable experience while we work together to keep your smiles bright! While you’re in our care, your comfort is our primary concern. Our entire team is focused on ensuring that your visit with us is spent relaxing and positive, allowing you to enjoy your time with us, and leave feeling refreshed and smiling. Our Family based dental practice located in St. Albert, Alberta caters to entire families, offering our patients a single, trusted dental practice for the whole family. At Family Dental, we build relationships that last generations, and set the foundation for a lifetime of happy, healthy smiles.